I want to bring the red line (A) to the front, on top of B (see the cross point), while the colors and the order they appear in the legend do not change. Is there any way? Replotting the red line using a subsetted dataframe does the trick. EDIT: Note that ggplot applies layers sequentially on top of each other - this can be best leveraged when constructing the plot line by line. The solution with replotting is fine unless you have reasons to avoid it. I can think of at least two: using alpha (transparency) or performance issues (you need to do it in one run, big data). The order of your A,B inside data.frame(x=1:10,A=1:10,B=10:1) is causing this layering issue because it is drawing A (1:10) first. 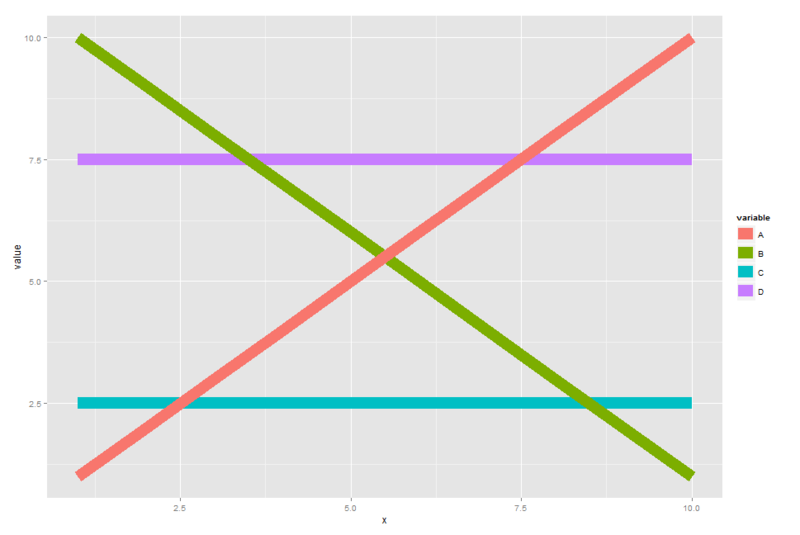 If you use data.frame(x=1:10,A=10:1,B=1:10) is will put the ascending line on top (since B is drawn last).